Protector Plus Antivirus is a powerful antivirus software that was developed to protect your computer from viruses, trojans, worms, spyware and other potential threats. The app is easy-to-use and has a set of innovative features. It is continuously updated to efficiently handle the ever-changing threats posed by all types of malware. Protector Plus users are assured of committed support and timely updates. Protector Plus is designed to perform reliably at home as well as in a corporate environment. 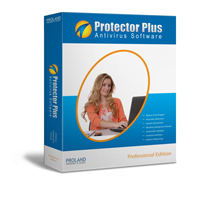 · Protector Plus has been designed with all new interface for easier use. All critical components of an anti-virus software are available at the click of a button. The interface is intuitive, even first time users find it easy to configure Protector Plus for their needs. · The scan engine is fine tuned for a better scanning performance. To detect the latest viruses a new heuristics scan technology is implemented to provide maximum security. · The Real-time scanner of Protector Plus is designed to monitor the system all the time. It prevents any virus from entering the system during the activities like browsing the internet, accessing the network or while using removable media like cd-rom, usb drives, etc. The Real-time scanner will ensure that the system is free of any security threats. · Improved email scan with the latest technology of stopping infected emails at the incoming port before they reach your Inbox. Email scan configurations are automated to make it easier even for first time users. · InstaUpdate feature of Protector Plus will automatically download the virus signature updates in the background without disturbing the user. It can download hourly updates to provide protection against the latest threats that spread rapidly. · A powerful feature, which assists the support executives at Proland Software to provide product support and to investigate the users' system. Through the user friendly interface files can be easily submitted to the virus analysis lab. Users can submit the suspicious files like those loaded at the system startup, the files that are heuristically detected as suspicious or the files moved to the Quarantine folder. Every submission is analyzed and a report is sent to the user. · Virus database updates which are compact in size are released everyday. Added to this, emergency updates are released whenever there is an outbreak of a virus in the wild.